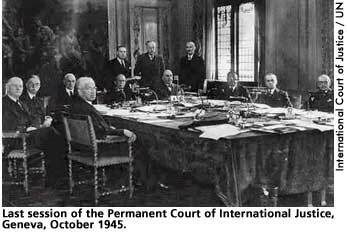 The Permanent Court of International Justice, commonly known as the World Court, was first proposed during discussions involving the Treaty of Versailles as an effective replacement for the ineffective Hague Tribunal. Article 14 of the Covenant of the League of Nations instructed the leadership of the league to design a Permanent Court of International Justice "competent to hear and determine any dispute of an international character which the parties thereto submit to it" and capable of giving "an advisory opinion upon any dispute or question referred to it by the Council or by the Assembly." The World Court opened its doors in 1921 after the Covenant of the League of Nations was ratified by forty-two nations (sixty-three governments would join the league before its demise in 1946). President Woodrow Wilson, despite his passionate efforts, failed to convince the Senate to ratify the treaty; therefore, the United States would not be a member of the league or the court. Ironically, Germany joined the league in 1926 and the Soviet Union became a member in 1934 (only to be expelled in 1939). Unlike the Hague Tribunal, which exerted diplomatic rather than legal influence and which relied on a floating pool of judges, the World Court assumed a judicial role and had a permanent panel of fifteen judges appointed to nine-year terms on hand to hear cases. Cases argued before the court focused on disputes between nations who agreed to argue before the court and accept its decisions. To insure that its judges were not biased, the court paid judges a salary, forbade them from working on any other government or legal project, and made sure that no more than one judge per country sat on a judicial panel. Ironically, even though the U.S. did not ratify the covenant and thus did not recognize the court, an American judge was a constant member of the court's panel of judges. The 1940 German invasion of the Netherlands so dramatically limited the court's actions that it lay dormant until 1946, when it was reorganized as the International Court of Justice of the United Nations. During the twenty years in which it was most active, the court issued thirty-two judgments and twenty-seven advisory opinions, all of which helped develop a body of international law. ER was a fervent supporter of the World Court. As co-chair of the Bok Peace Prize Committee, she worked tirelessly to generate support for the court and encouraged FDR to speak out on its behalf. FDR supported the court throughout the 1920s and as a presidential candidate; however, he did not allow Democratic senators to push for the court until late 1934. Isolationist senators rallied opposition to U.S. membership in the court. ER responded by giving numerous speeches, writing several articles, and declaring her heartfelt support for the court in her press conferences and other public appearances. FDR did not push the Senate as hard as ER pushed the country and the Senate rejected membership in the court by a seven-vote margin. The Avalon Project, Yale University Law School. "The Covenant of the League of Nations." Internet on-line. Available From http://www.yale.edu/lawweb/avalon/leagcov.htm. Cook, Blanche Wiesen. Eleanor Roosevelt: Volume Two, 1933-1938. New York: Viking, 1999, 235-242. Graham, Otis L. and Meghan Robinson Wander. FDR: His Life and Times. New York: Da Capo Press, 1988, 206-208. Morris, Robert B., Henry Steele Commager and Jeffrey B. Morris, eds. Encyclopedia of American History. 6th ed. New York: Harper & Row, 1982.